Open from Server vs. Get Latest Version: What's the Difference? ANCILE uPerform® provides two different ways to download and access files once they have been checked in to your uPerform website. Even though both of these methods accomplish the same task, they are normally used for different reasons. Below we will go into the purpose of each method and some pros and cons. This method requires that you have the uPerform Client installed on your computer. 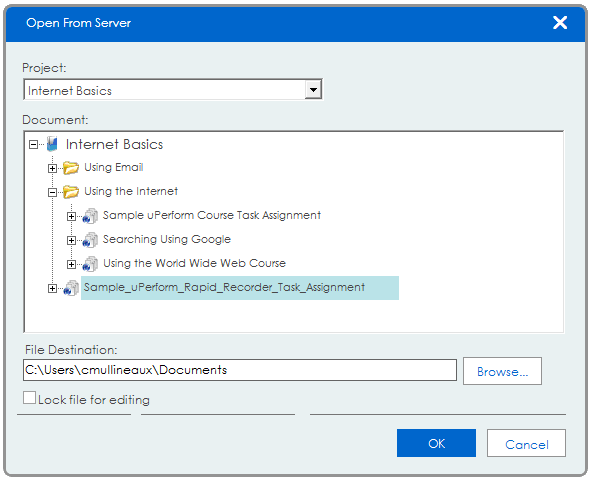 Once in the Client, you can go to File -> Open -> Open from Server and given that you have the proper access on the uPerform website, you will be able to download this file from the server to a specific location on your hard drive, edit it, and check it back into the website once you are done. This is the recommended method of opening files from the server for authors and also the quickest and most seamless way for file editing. 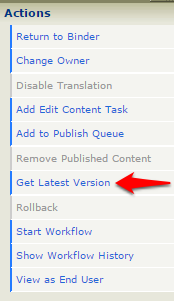 As an author or administrator, you may notice a Get Latest Version link when navigating to your document on the uPerform website. When you click this link, you will either be prompted to choose a download location or the file will automatically be downloaded to your default downloads location, depending on your browser settings. This method is good if you need easy access to the actual simulation (.UDC) or course (.ULC) file. You might use this method if you need to send files to someone who may not have access to the uPerform Client or uPerform website or if you want to store these files in some other location such as a network drive. If you don’t have the uPerform Client installed, this is the only way you will have access to download your uPerform files. One issue we frequently see is that authors will not realize they already have a copy downloaded to their default downloads folder. When this happens, numbers such as (1) or (2) will be appended to the name of the file and when the file is opened in the uPerform Client and checked back into the website, these numbers will remain in the name of the file and can potentially cause confusion to end users and overall just doesn’t look pretty. Ultimately, it is up to you which method will work better, but it is always a good idea to know your options.